The first mass combat drop of World War Two was made by the Germans in Holland in May 1940. The British saw the advantages of using parachute troops and from 1940 onwards established parachute units. America formed its first parachute units in 1940. Other significant parachute drops of World War Two include Crete, Tunisia, Sicily, Normandy, Holland, the South of France, the Rhine and Nadzab in the Pacific. There were also many other smaller drops. The largest Airborne operation in history was Operation Market Garden in September 1944 when 35,000 troops from three divisions (two American, one British) were landed by parachute and glider in Holland. 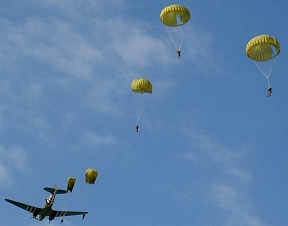 Since World War Two paratroopers have been used less on mass drops. New techniques of HAHO and HALO were developed for inserting special forces teams into enemy territory. The French used paratroopers extensively during the war in Indochina, Dien Bien Phu being the best known. The last mass drop by British Paratroopers was at Suez in 1955. Israeli paratroopers made their first and only mass drop in history in the same conflict. Paratroopers have also been used in mass drops in the Indo-Pakistani wars, Vietnam, Afghanistan by the Soviets, Grenada by the American's, the wars in Angola and Southern Rhodesia by South Africa, Panama by the Americans, and most recently in Afghanistan in 2001 and Iraq in 2003 by the American's. Today, most armies operate parachute troops for one role or another. Many would argue that since the advent of helicopters, paratroopers have became obsolete. Others argue that there is still no better way of landing a large unit of troops in the one place so quickly and efficiently. There are three basic types of jumps from an aircraft: LALO (Low Altitude Low Opening), HAHO (High Altitude High Opening), and HALO (High Altitude Low opening). The traditional method of inserting airborne troops is by mass parachute drops at low-level (150 - 600 metres / 500 - 2000 feet) by round canopy, static-line deployed parachutes. Known as LALO, the advantage of this is that a large amount of troops can be dropped into an area quickly and spend little time in the air. The low flying aircraft may be able to avoid enemy radar. A large Drop Zone (DZ) is usually required. For mass combat drops, troops are normally dropped below 300 metres (1000 feet). The disadvantage is that the slow, low flying aircraft are much more vulnerable to anti aircraft fire. Modern parachutes specially designed for low altitude jumps can allow jumps at the extremely low altitude of 76m (250 feet). Static Line refers to a mechanism that activates the parachute when leaving the aircraft. The parachute ripcord is attached to a cable running along the inside of the aircraft. When the jump is initiated - the line unravels to full length (~30m) - before pulling taut and drawing the parachute from the pack - freefall time is about 2-3 seconds. These so called Static-line jumps are usually carried out at low altitude in order to reduce the time the jumper is exposed to enemy fire. Static-line jumps are also usually restricted to large unit deployments only. Proper exit - check body position and count. Proper body position is to ensure the jumper does not tumble out of the aircraft, making it less likely that the parachute will deploy and become entangled. A count to four ensures that the jumper gives their chute adequate time to deploy and if needed to deploy the reserve parachute. Check canopy and gain canopy control. Ensures that when the parachute deploys there are no defects, which may force the jumper to deploy the reserve. Keep a sharp lookout during the entire descent is intended to prevent collisions or "theft" of air. This is done by the rules of three:  Always look before you turn -  Turn right to avoid collisions -  The lower jumper has the right of way. Turn into Wind and Prepare to land. Maximises the control of the descent and decreases the speed of travel. Land - Execute a proper parachute landing fall (PLF) by using motion to transfer the force of impact when hitting the ground. HAHO & HALO are most commonly used by special forces units for covert operations behind enemy lines. The high altitude - usually above 8200m - is well above the visual and auditory range of enemy ground troops and also at a safe distance from most Anti-Aircraft fire (AAA). The disadvantage of HALO and HAHO jumps are that the high altitude requires special equipment due to the environmental pressure and temperatures. The jumpers have to bring oxygen (above 4250 metres / 14000 feet), respirators and protective clothing in order to survive. The advantage is that the jumpers should be able to land on smaller Drop Zones (DZs). HAHO is used to drop parachutists at high altitude to allow them the glide into their landing zone. The jumpers are equipped with specialised square parachutes that are highly steerable with good forward speed. This type of jump allows the paratrooper to glide in to their landing area, often for some distance. (up to 80km) This type of jumping requires good navigational skills and a knowledge of wind and atmospheric conditions. It allows the aircraft to fly outside enemy airspace and insert them without the enemy hearing them. HALO (also known as Military Free Fall [MFF]) requires that the aircraft flies closer to the landing zone although at a high altitude (usually above 8200m). The jumpers uses a method called "freefall", where they fall freely for 2-3 minutes (about 95% of the drop distance) at a relatively high speed towards the landing zone. By pulling the cord and deploying their parachute between 300 - 600m (1000-2000 feet), this technique helps the jumpers to make a near silent insertion - avoid radar systems etc. and provide them with minimum exposure until the very last minute. Poynter, D & Turoff, M (2004) Parachuting: The Skydiver's Handbook. Para Publishing, CA, USA.